It's been about 10 days since I shared my Now What? plea, right after I put all my Bee Sewcial Mid-Century Modern blocks up on the design wall. 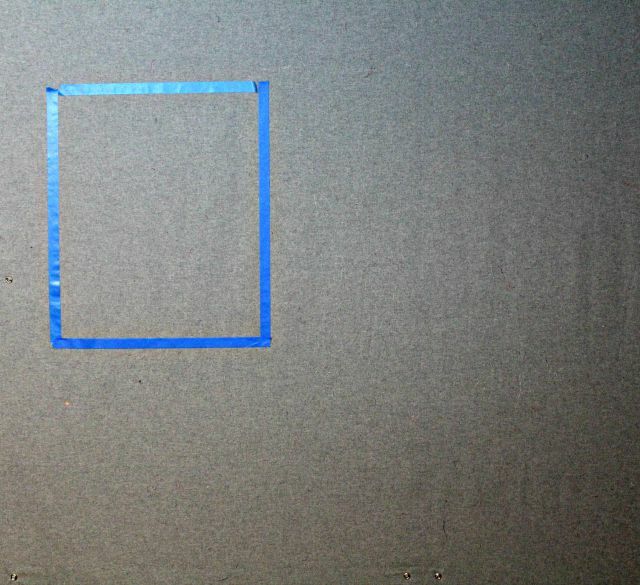 After a few helpful considerations from others, I plunged in, beginning with a very basic concept: I made a frame of blue painter's tape on the design wall. I first heard about this suggestion in a class with Katie/Sew Katie Did. Basically my bee blocks were overwhelming me with all their varied sizes and shapes (exactly what I'd asked for by the way! ), and by making this 18"x22" frame, I was able to fill the space and piece the blocks together in a more organized fashion, at least in a way that wasn't quite so random. Here's where I started with the first block. Then I filled in with solids, echoing that micro line going through the block of diamonds. 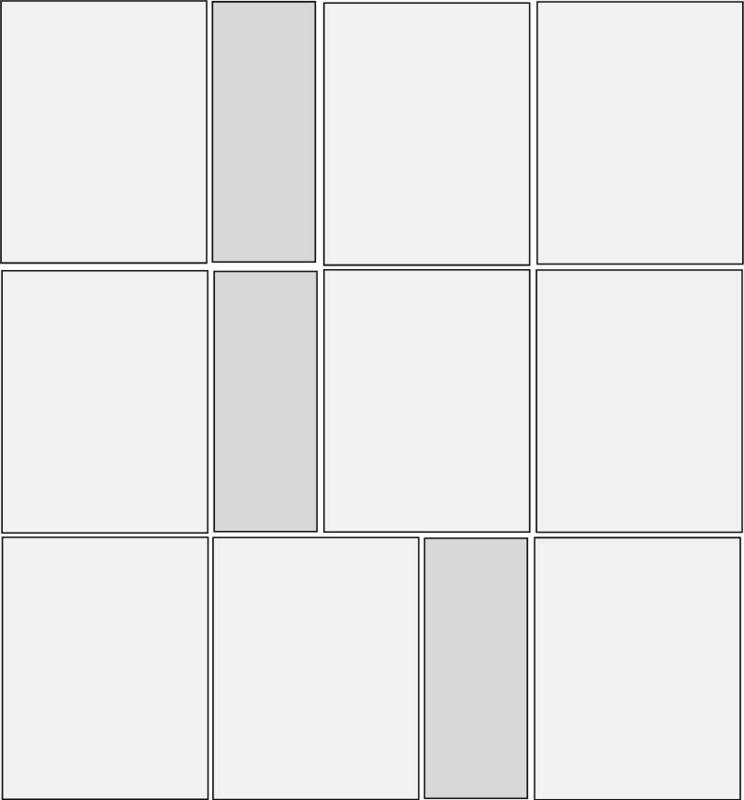 I was pretty thrilled how that worked out, though all the blocks didn't lend itself to that. But you will find filler solids trimmed with a contrasting 1/8" throughout the quilt. So the finished top is 62"x66" and I've started quilting! I came up with a crazy free-motion stitch when I took a class with Christina Cameli a few months ago, and I knew instantly I wanted to use it on this quilt. It felt like something I could manage yet was a bit unique, so I'm going for it. Now....what shall I call it? Anyway, I've really just begun, and wouldn't you know it, but my machine began acting up, so quilting is on hold for a while. But this crazy thing is put together and I know where I'm headed, and I'm more than happy with that! What about calling it "Heading in the Right Direction"? "Back to the Future'? Whatever you decide, its a great quilt! Good luck with the sewing machine repairs too! When I stitch this stitch, call it The Heartbeat Stitch..
heartbeat is what I thought too. it's stunning! thanks for sharing your process. That is such a cool stitch! Can't wait to try it ! I thought "heart monitor" or "heart beat." "Pulse" would be more succinct. Looks great! 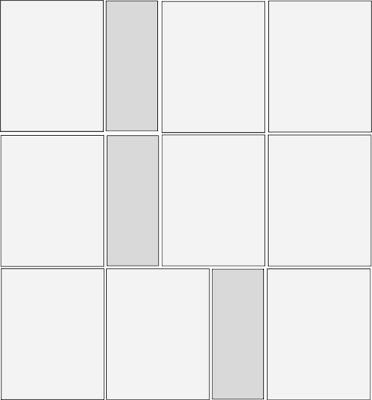 I love your method of piecing these blocks into smaller sections. Lovely result; a brilliant solution to the block layout challenge. I think heart-beat is a good name for the quilting stitch; I shall be trying it soon too, thanks! Brilliant way to put those blocks together! I love how it turned out, perfect! 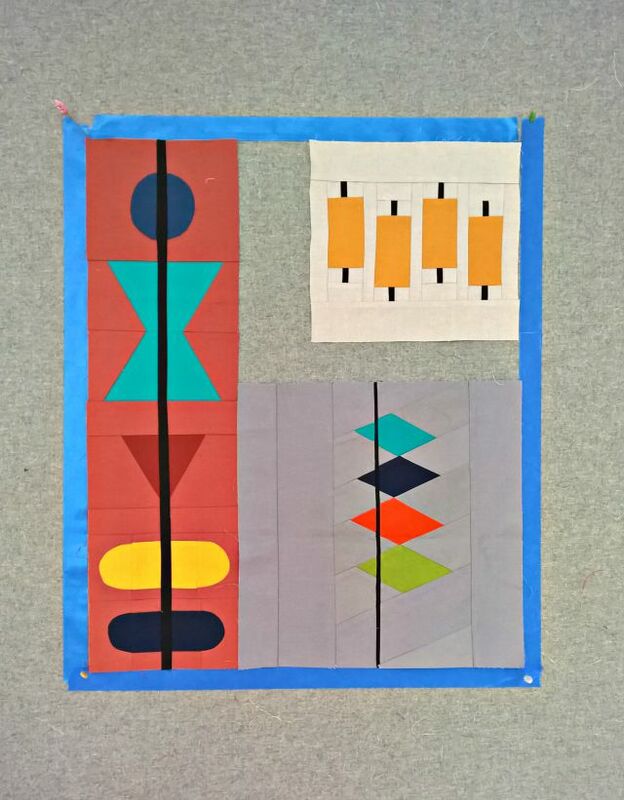 I did a similar quilting design years ago, not FMQ! Thanks for the reminder and it looks great with the quilt! I hope your machine gets back on track soon, I'm anxious to see it finished! great idea with the painter's tape to set up each block. the quilt looks great! This is sooo good! Such a clever way to figure things out! Great approach to solving your block puzzle. I can't imagine trying to make it all work and you did it! love these shapes - reminds me ot 1950's or 1970's furniture it comes and goes every 20 years or so. this is one of my all time favourite quilts... wow! I'm glad to see another Bee Sewcial quilt underway, and sorry about your machine, mine actually DIED during quilting. I earnestly hope this is not a trend. I too have Naming Deficit Disorder (NDD) for short, having to rely on a brilliant suggestion from Karen (capitolaquilter). 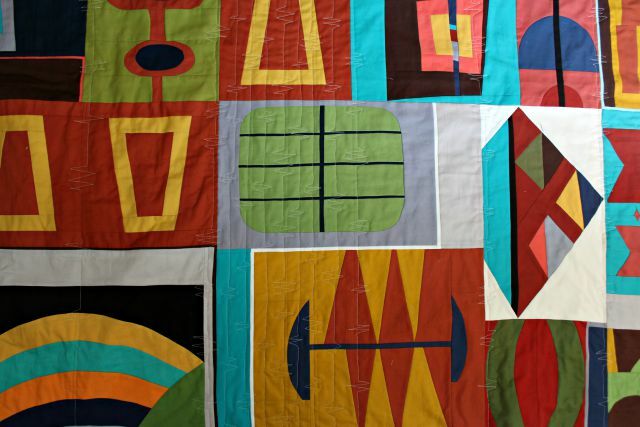 But something about this quilting and the mid-century month in general….. I agree with Alison; quilted top to bottom it reminds me of the seismographic tracing of our earths shifts/movements. This quilt skillfully represents more than one movement, your love of mid-century design and it's far-reaching impact on art/architecture and quilt design interpretations by Bee Sewcial and all that has happened this year because of that (not implying by any means they are of the same magnitude); so I'm throwing my hat in the ring with "Seismograph". this is amazing! that quilting looks like a heart rate monitor or lie detector or something... Love it! Totally love this technique with the blue painters tape! Such a great way to put it all together! It looks great and I love the quilting! Very cool quilt. So mid-Century Mod! I can't wait to try the painter's tape technique. It looks awesome!!! I'm feeling your pain with a machine acting up. It's no fun! But the quilt is awesome! 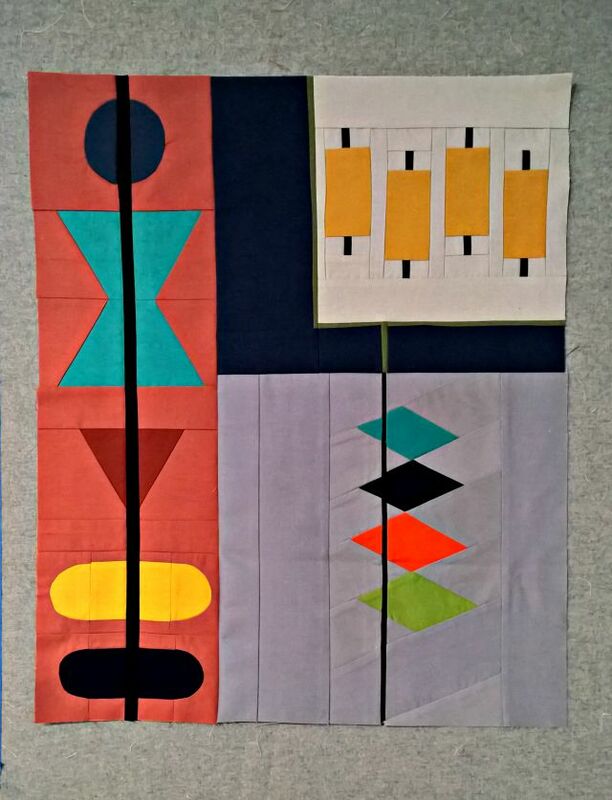 Debbie, that technique for grouping odd-sized blocks is fantastic - thanks for sharing! I love how you put this together and I love the heartbeat quilting motif. 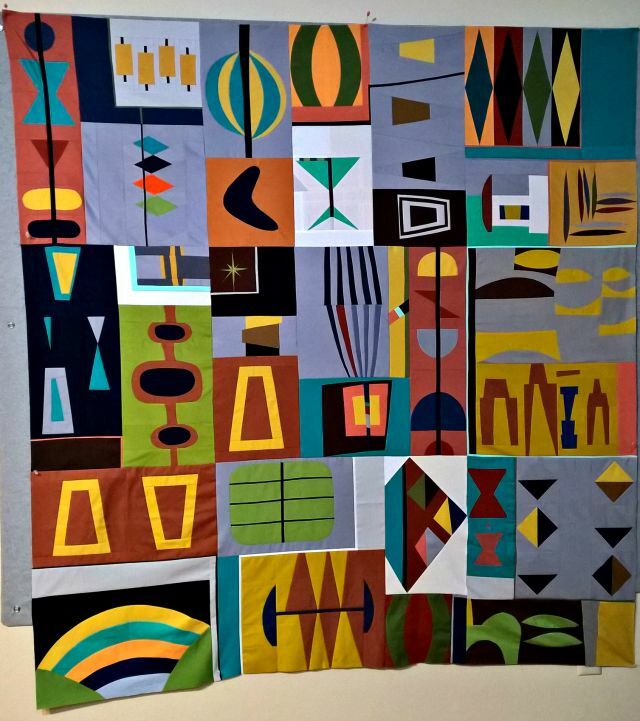 Such an amazing quilt Debbie - those blocks are so cool as is your quilting! 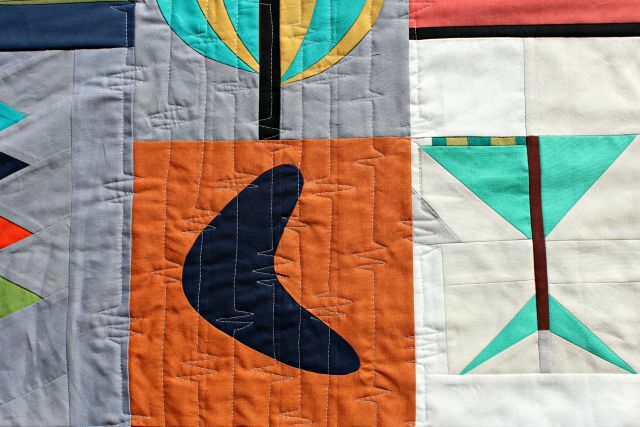 The quilting is a perfect match and your quilt is looking fantastic. I hope your machine is already better. I had never heard of that tape off a square idea - brilliant! It looks great! You need to put this in a show someplace. This is award winning!! Very cool! How about Electrified or Heartbeat Song? There is only one name I could call this..."Mod" ...what an amazing collection of fun!